Creating this card is very easy, so let me show you how: Cut a piece of whisper white card stock and add some spots of Helmar Craft & Hobby PVA Glue. Smear the glue with your finger and let the glue dry completely before moving on to the next step. Die cut the piece using a Cross Stitched Decorated Frame. I used the large frame from Gina Marie Designs. If you want you can remove the die cut or to create a best inking effect, keep the die cut in place and start to apply distress ink over the surface, remove the ink over the glue spots using a dry cloth. I used Tumbled Glass distress ink. You will notice immediately how the inks highlight the glue, yielding a grungy, distressed feel. Take off the die cut frame and stamp your main images. I used the Pine tree included on the stamp set Merry Christmoose from Joy Claire with three different colors of green ink. I used classic ink in Garden Green, Wild Wasabi and Gumball Green. Paste the decorated layer over a card base using the Helmar Runner Adhesive. This product is great to create cards and scrapbook projects! I used a card base cherry cobbler and the size is 4-1/4"x11" with score in 5-1/2". Stamp a sentiment in a piece of Vellum using VersaMark and Verdigris Embossing Powder. Paste this piece over the decorated layer using Clear Zapdots. These are totally transparent and are not translucent over the vellum. To finalize add some loops of thick red and white baker's twine. As you can see this technique is very simple and creates a great effect over the card stock but you can also can use it over canvas or any other surface. Thank you for stopping by and see you soon with more creativity to share. Out Of this World with Helmar! Hello crafty friends..Cathy here to share a post with you today using 4 wonderful Helmar products and an adorable SVG file from KaDoodle Bug Designs. I decided to do a scrap layout and started out by cutting out all the pieces of colored cardstock on my Cricut cuttingMachine of the Out Of this World file.. I used Helmar Craft Glue to put the pieces together, for the real small pieces I used a zig pen. Then, I cut out the big pieces for the base of the layout and the larger elements. It's me, Krisy, back again today with my second share for this month. For this blog post I was given the them of "Scraps". My initial thought was "What the?!?" Then I stopped and thought about all the projects I envisioned sharing when applying for the Helmar Design Team and which ones would work for this theme. Then I knew exactly what I wanted to create. With Christmas fast approaching I knew I had to get a wriggle on and document last Christmas. Now, if you follow my personal blog you will know that me and December Daily don't really go well together. If you're interested you can read about it here. So, with that being said, I still take photos and need to put them all together with a bit of information so I created a Christmas Mini Album. It is using all "Scraps" from the deep dark regions of my Scrapbooking room including all the bits of wrapping paper and ribbons I have saved as well as bits of cardboard mail boxes that I have saved. They are not able to be used in the post again due to "rough handling" by our delightful mail service but are clean cardboard sheets that are a perfect thickness for crafting. It is a mish mash of all things Christmas. I find that no matter how hard you try and co-ornate Christmas it always ends up in a mess of all colours. I wanted to embrace that mess in my project hence all the "Scraps"
- Helmar Glue - I used Fabric Glue, 450 Quick Dry and Professional Acid Free Glue as it is my favourite. You don't need to own all of these glues to make this album any one will do the trick. - photos ranging in size from 3x4 and smaller. -And anything else that tickles your fancy. This is how you put it all together. 1. Cut out at least five cardboard tag shapes, I used a die but store bought is ok.
2. Cut out enough "scrap" papers the same shape to form the base of each page. You can just trace around one of your cardboard shapes and cut it out. You will need enough to cover the front and back of each page. When you are cutting be mindful of the patterns on your papers and the direct they are flowing. Make sure they correspond with the direction you decide your album will face. My album is horizontal but you could always make yours vertical. 3. Set aside two cardboard tags for your front and back covers. To all the other pages, glue in place a piece of wrapping paper to each page front and back. 3. Now for the front and back covers, I used some left over fabric. If you do this, make sure you leave enough fabric around the edge of the tag to wrap around the edge. The ends will be covered by the backing piece of paper. By wrapping the edges, it finishes the cover a bit nicer and will prevent it from lifting. This is important as it is the cover and will endure more than the inside pages. 4. Glue in place a piece of paper to each page front and back. Your basic pages are now done. All you need to do now is add photos and embellish each page. To make the book a bit more exciting and interactive to look at, I created flaps and pockets. These are easy, just use a little washi tape on some scrap pieces of Christmas cardstock. Make sure you use some glue under your washi. The glue on washi tape is not very strong and will come off very easily. Or just glue a piece of cardstock across the page (only put glue at each end) and slip in some pieces of cardstock with journaling and photos. On the back of these, I have written the recipe that we used to bake the cookies in the photo. Don't forget to add some journaling. Don't forget to decorate your ring with some ribbon scraps and any embellishments you have. Oh and add a ribbon to keep everything together. These little albums fan out pretty quickly and the addition of a ribbon helps keep everything together and stops anything from falling out. You can tie it to the front or back depending on your cover embellishments. I didn't want the bow to cover it up too much so I tied it to the back. There is also a YouTube video for you to watch. 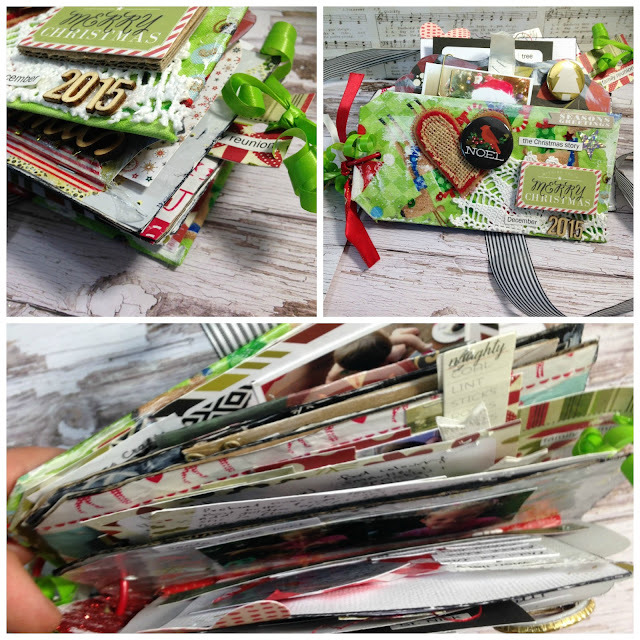 You can see me put this album together plus there is a little slide show at the end of all the inside pages to give you more ideas of how you can embellish your pages. You can find the link here. Be warned it's a bit of a long video so make a coffee first. I hope you enjoyed this easy Mini Album. Remember you can use this concept to record birthdays and other events too. It is a nice way to keep little memories like wrapping paper and gift tags without just hoarding them in a box. By using bits of wrapping paper, I believe we are recording trends too. Wrapping papers change and prints are often nice to remember eras. As for gift tags that are hand written it is a nice way to preserve handwriting of loved ones. It's Ornament Time with Tamiko!!! Every year i make it a point to make ornaments. Just a small batch or two. We have a small slender pencil tree this year and I had to make a few ornaments. My ornaments don't necessarily go with the color scheme of the tree, but I don't care. (haha, don't tell my mother) I don't do a lot of personal decorating for the holidays and always buy clearance items after the holiday for the next years holiday. (shaking my head) Let's see what i came up with.. I always buy little wooden ornaments. They are also good for more then just ornaments on your tree. Glue a magnet on back and put a motivational message on front and the little ornament can become something you can use all year long. I buy enough that I still save some left for Christmas though! I get a pack of Christmas napkins, wooden ornaments, small embellishments and HELMAR! I grab my Helmar's Decoupage and Craft Paste and to be totally honest with you, it comes in full strength ready and waiting to decoupage the heaviest of card stock. I don't need the paste to be so thick for a layer of tissue. So I drop a little paste in small container I can see through and add water.. about a teaspoon at a time, then stir it till it's more so a creamy consistency. I separate my layers of the napkin, only using the top layer with all the color and images. Brush some of the diluted paste on the ornament; take some of the napkin and let it lightly fall to the wet surface. Tap your hand or fingers across it lightly, to make it adhere to the glue mixture. Make sure you add glue to the sides, then tear off the access paper. If the tissue tears, don't worry you can patch with a small piece of from scraps. Coat the ornament with a second layer of the glue mixture. Once its dry you can, if you want to, use a small bit of sand paper to smooth any rough edges. Don't forget to paint the backside a solid color. Finally add any embellishments you want!! I added trim to the sides, paper leaves to the top all with Helmar's Super Tac! Tadaaa!!! I love my little kinda vintage type of ornaments, don't you? I hope you take a moment to get some Helmar's adhesive in your home, just in time for the holidays! Hello there, Sue here with a layout of me and my lovely friend, Cat. I created this with some really useful Helmar products. I started with the following. I began with white cardstock and paint. I used a Helmar glue scrapper to flick paint over the cardstock randomly. Then I sprayed Helmar crystal kote gloss varnish straight over the paint. I waited a few hours so that everything was dry and continued with the rest of the layout. I wanted to raise the photo off of the page so I used Helmar liquid scrap dots, I love this stuff for dimension. I used Helmar tacky glue on the patterned papers and Helmar craft glue on most of the embellishments. Lastly I used Helmar gemstone glue to apply the sequins, they’re not moving now! I just love how this one turned out. All the Helmar products I used are a fab addition to my stash! I must say that this project evolved as I worked on it – in the photo above I had chosen some stamps that I thought I may use… I ended up using one set out of these - Claudine Hellmuth Studio creative layers "Domestic" clear stamp collection and two Kaisercraft clear stamps - script and lattice for my background stamping. Let’s get in to it – first step is to brush the decoupage paste straight on to the canvas, put down the gelli prints and then put another layer of decoupage paste over the top. This doesn’t have to be perfect – I like the small lumps and bumps the paper creates one wet with the paste (as you can in the close ups picture later on), this all adds to the rustic feel of the canvas. Leave to dry. Next step is to add a layer of white gesso with a brush – you could use palette knife or fingers if you want to get messy! Leave to dry. Stamp your images onto white tissues paper / deli paper. In this case I decided to use what I had and also included some coloured tissues paper. I added additional ripped pieces of tissue paper to the canvas to add more texture. As you can see later on, a lot of this was painted over but helped build the background layers. Apply the stamped images to the canvas using the Helmar decoupage paste. Leave it to dry. Apply paint with your fingers (I found this was easier and fun) to the canvas around the images. Here I have used Dylusions paints in various colours. I love the vibrancy of these paints, but you could use any acrylic paint. It’s a good idea to dry in between each colour to prevent them from mixing. Colour your stamped images in with big brush pens or other markers. Apply texture paste through a stencil on two corners of canvas. When dry, blend in the gelato colours with your fingers. Gelatos are a stick of soft colour (almost like the consistency of lipstick) that can be blended with your fingers, a baby wipe etc. I used a couple of colours on this project and also added some metallic purple to the canvas itself. Dry with heat tool to set the gelatos. Stamp the background stamps of your choice randomly over the canvas, using black ink. Next, apply Viva Gold (you can use ink, paint or leave it raw) to the wooden veneer piece (love this piece from Flutterby Designs) and around the edges of the canvas. Dry with a heat tool. Adhere the wooden veneer piece using the Helmar Quick Dry adhesive. Next is to seal the canvas with Helmar Crystal Kote Gloss Varnish. This is also available in a Matte Finish but I like the shine the Gloss has. Quick drying time - 10mins touch dry which is fabulous! I made sure to spray this outside so I didn’t get it everywhere! For the finishing touches….glue on the pearls for the bird cage and dress using the Helmar Gemstone glue and then sit back and admire your fantastic work! Here are some final close up shots of my project! I hope you’ve enjoyed this and will give this a go yourself! Would love to see what you create…. Hi all Vicki-Ann here for Helmar today. On Sunday I was live on Periscope doing some Gelli printing on some deli paper and I loved the way this print turned out with the flowers. It was so pretty so I decided to use it in the background to make a small canvas. Wooden banner letters from TYPO. I used the Helmar Decoupage and Craft Paste and spread it over the canvas panel with the paint and glue spreader. Then placed my deli paper print over the top and used the paint and glue spreader to get any air bubbles and lumps out. I painted some music paper with some Gesso then painted the background with some Decoart paints using the paint and glue spreader. Then I stamped the Tim Holtz butterfly stamp on top of that. I put that on top of some canvas material using some Helmar Tacky Craft Glue waited for that to dry and then sewed it on the side with black cotton on my sewing machine. I threaded some twine through the wooden letter banners. Then tied some bows through 2 buttons to hold my banner at the sides. I used the Helmar Scrap Dots on the back of the buttons, as it was over the top of the twine so with the dimension this worked great. Using Helmar Tacky Craft Glue and the paint and glue spreader. I placed my sewed butterfly panel on top of my deli papered canvas. this protects it from dust and fading and keeps it from yellowing. There is nothing more beautiful than a sleeping newborn and today I have a layout featuring my daughter less than a week old. I wanted to create a dream like layout in keeping with my photo. I chose a wood grain background paper and splattered some gold paint over it lightly. I have used a heart cut file and attached gold glitter paper to some hearts but you could simply hand cut a heart and then use a heart punch to create the same effect. I have used the Helmar Craft and Hobby PVA glue to attach my heart background. It dries clear and your paper will not crumple due to using a wet glue. I framed my photo with a gold chipboard frame to ensure it remained the focus of the layout. Here I used the Helmar Professional Woodworking PVA glue which is ideal for soft woods and chipboards (my frame being a heavy chipboard). I used it also to attach my wooden flair at the top of the frame. To finish of my frame feature I have used a cut file floral cluster which I backed with a pink striped paper. I used the Helmar 450 Quick Adhesive as the paper piece was fine and I wanted it to dry quickly with no unsightly marks, this glue dries crystal clear so it was perfect. I Used Helmar Premium Craft Glue to attach my quote 'my sweet baby girl' as glitter can be difficult to attach to and this glue worked perfectly. I used Helmar Gemstone Glue to attach the gold dot just under my floral cluster. I wanted to create another feature in the upper left corner so here I went for a cloud and stars in keeping with my theme. I used Helmar Scrap dots to attach the acrylic cloud to give the illusion than it was floating. I then used the Helmar Premium Craft Glue to attach the Acetate star (needing it to dry clear as it wold show through if not) and finished with an acrylic star attached using the Premium Craft Glue again. My title is another cut file, using white card stock, I then brushed on the Helmar 450 Quick Dry Adhesive and then sprinkled some glitter over it before it dried to add texture and visual interest. When completely dry I then attached to my page again using the 450 Quick Dry Adhesive. I finished off my title adding a chipboard bow using the PVA Professional Woodworking Glue which is brilliant for attaching heavy materials such as chipboard. Hello Helmar friends, Lydia back to share a fun and simple project using old book paper. Today I am sharing how to make a book paper banner which is a cute an quick project. This project only took me roughly 10-15 minutes. That's right, that is all you will need for this project! Firstly I cut out some triangle from the book paper. I roughly did this as I didn't have a template but of course you could use a template. Next I just added a little bit of adhesive to the top of the triangles and adhered the twine. And the lastly adding the little pretty embellishments. I hope you enjoyed this little and simple project using of book paper ad hope that you create a little banner too. 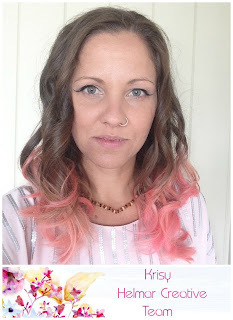 It's Krisy back today with my first share for this month. I was given the theme "Trains" as my topic to share today. My initial thought was to scrapbook some photos of my kids at the Railway Workshops, a local museum exhibit close to home but to be honest that was a bit boring. I decided I would find some photos from our travels. We travelled a lot by train all over the world but nothing appealed to me until I came across our photos of a trip to Auschwitz concentration camp. This place moved me. I love grunge heavy mixed media scrapbooking layouts and this experience had me filled with ideas that captured all my favourite things. So, I decided to create a grungy, heavy mixed media scrapbooking layout. Just a bit of background on the photos. These are photos taken at Auschwitz Concentration Camp in Poland. It is a place that evoked so much emotion that I totally did not expect. It is a very dark place. This is one train journey I am glad I was never made to take. If you would like to know more you can read all about it here. This and most of my layouts are all about the techniques used to create interesting backgrounds. Everything added on top is to embellish and compliment the layout. I am just going to give you a basic run through how to create it. Mixed media to me, is about creating something that is free flowing and more than likely, very hard to duplicate again. That's why I love it. So, with this in mind, I can only give you basic instructions and a basic list of what you will need, the rest is up to you. Have a go and see what you can create. Kraft Cardstock, old used teabags, gel medium, printed images, inks, stamps, permanent ink pad, embellishments (chipboard, wire, thread and whatever else tickles your fancy), Cardboard, maps and your Helmar products - 450 Quick Dry, Acid Free Glue and Scrap Dots. This layout has a very layered mixed media background. I love layers and textures. When I create a layout I want the finished product to have so much to look at that it just makes you want to touch it. I started by applying some Matte gel medium all over the cardstock using an old rewards card. Gel medium creates a waterproof base to protect the cardstock when you are adding wet mediums and stops them soaking in. I used matte as I didn't want any shine on the background. Once it was dry I began adding layers. The first layer is torn used teabags. This adds texture and colour to the base of the layout. To grunge up the background a bit more, I applied some gesso using a palette knife in a scraping motion. This breaks up the background and creates a different base for the colour layers to stick to. Over the top I tore and glued down some printed newspaper articles. To soften the starkness of the white I added a few more tea bags. Once that was dry I began applying colour. I used Colour Blast Colour Spray in Mocha and Coffee colours to spray on some colour using some wire chipboard pieces as a mask and stamp. One important tip is to make sure you dry the layout really well between colours, this will stop them from mixing too much. I also added some Colour Blast Shimmer dust in Navy and made runs down the page. I repeated this process with Colour Blast Colour Spray in Sunset, making sure I was drying between colours. Once the base colours were dry, I added some texture stamping using different stamps and permanent black ink. I know at this stage I am going to be adding more wet mediums, so it is important that the ink is permanent and doesn't react with any water I apply. Now the background is finished, I began adding all the details. I added a cardboard detail across the middle. This is just a torn strip of cardboard that I am using to add more texture detail to the layout. Over the top of that I glued on a strip of a map of Poland. This ties in the location of the photo as well as the flair button that I have chosen to use on the layout. Then I went ahead and glued everything into place. Starting with my photos then adding all the chipboard and textures. I like my mixed media layouts to come together fairly quickly, my go to glue is Helmar's Acid Free but sometimes when you are adding lots of heavy embellishments and want to work fairly quickly 450 Quick Dry is the way to go. I used two different glues to stick all the bits on to this background. The reason why is because, the heavy cardboard I chose to use was just that... heavy. I wanted it to stick in place quickly so I could carry on with the layout. For the photos and chipboard pieces I used Acid Free glue because of all the Helmar glues, it's the one that I like the best and I used on ALL my scrapbooking projects. I also used my Scrap Dots to add more dimension when sticking my photos and chipboard pieces in place. Scrap Dots is such a quick and easy product to use. I have prepared a process video of this layout so you can watch it all come together on my YouTube channel POPLEOPOD here. Thanks for visting today, I would love your feedback on my video and layout so please do let me know what you think. I will be back later in the month with a project that uses "Scraps" so make sure you pop back and check that out.